"D.K. Corporation (DKC)", Indore India is the leading manufacturer and supplier of different types of Neem Oil Emulsifier, Home Cleaning Chemicals, Industrial Chemicals, Textile Chemicals etc.. The Company was established in the year 1989 and since then it has been serving different industries like Paints, Textiles, Paper and Pulp, Detergents, Pesticides and Agrochemicals. DKC has a wide distribution network for efficient and effective delivery. It is well supported by qualified techno-commercial professionals for better customer service and application support. Adherence to quality management practices and total customer satisfaction are the company’s prime objectives. We continuously upgrade our product to meet the new challenges in the modern world. Our entire business activities are carried out under the strict guidance of our CEO, "Mr. Dilip Jain", who possess rich industrial experience with a Master Degree in Organic Chemistry and "Mr. Arpit Jain", Marketing Head of the Company is a Graduate in "Chemical Engineering and Technology from IIT BHU, Varanasi ". Their business acumen and expertise have allowed us to establish our organization among the leading players of the industry. Manufacturing and Trading of Products Offered By Us. A visionary entrepreneur, committed philanthropist and industry veteran with near three decades of expertise in speciality chemicals, Dilip Jain, founded D.K. Corporation specializing in chemical trading, in 1989. He earned his MSc in Organic Chemistry from University of Pune and started working at a chemical manufacturing unit after completing his graduation. While working, his sharp business acumen attracted his attention to the scarcity of raw material availability in the Central India region, which was plaguing the aspirations of continuously growing chemical industry. A stalwart, with strong desire to see Central India region on the chemical industry conglomerate map, he quit his job and subsequently founded DK Corporation in 1989. His son, Arpit Jain, a Chemical Engineering graduate from IIT BHU, aspires to carry forward his father’s legacy, of delivering best quality cost effective solutions, at par. Arpit founded Fenton Chemicals in January 2015, a speciality chemicals manufacturing unit in Indore, which offers higher production output and greater range of diversified products. Fenton Chemicals has developed a wide distribution network for swift delivery of ordered products. We are supported by a team of highly qualified technical researchers that drive continuous innovation at Fenton. At Fenton Chemicals , we strive to exhibit fundamental qualities that drive successful business relations across the globe - integrity, ethics, unparalleled customer satisfaction, personalized solutions to every business need, and last but not the least, commitment to walk that extra mile to earn customer trust and build everlasting relationships. D. K. Corporation is committed to being India’s premier Speciality Chemicals Company. To that end, we shall continuously achieve superior financial and operating results while adhering to the highest standards of business conduct. Our Company''s foundation is built on our unwavering perseverance in applying fundamentals of Chemical Engineering to deliver innovative and path breaking industrial solutions. In all our endeavours, we strive to exhibit fundamental qualities that drive successful business relations across the globe - integrity, ethics, unparalleled customer satisfaction, personalized solutions to every business need, and last but not the least, commitment to walk that extra mile to earn customer trust and build everlasting relationships. He earned his MSc in Organic Chemistry from University of Pune and started working at a chemical manufacturing unit after completing his graduation. While working, his sharp business acumen attracted his attention to the scarcity of raw material availability in the Central India region, which was plaguing the aspirations of continuously growing chemical industry. A stalwart, with strong desire to see Central India region on the chemical industry conglomerate map,he quit his job and subsequently founded DK Corporation in 1989. His son, Arpit Jain, a Chemical Engineering graduate from IIT BHU, aspires to carry forward his father’s legacy, of delivering best quality cost effective solutions,at par. 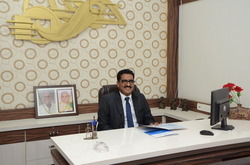 Arpit founded Fenton Chemicals in January 2015, a speciality chemicals manufacturing unit in Indore, which offers higher production output and greater range of diversified products.